Excitedly, we came across some news about season four. The executive producers of the hit television show sat down with Entertainment Weekly for the scoop. The dished some spoilers, so stop here if that is of concern. For everyone else, hold onto your seats. Edward Kitsis: He said they loved the idea of these characters for the show. They just took a shot and asked. Disney said yes. Adam Horowitz: They received a lot of support from Disney, and they are very grateful for that. What is your biggest concern taking this on creatively? Horowitz: They just want to do it the justice that it deserves. They would never think about trying to redo the movie. However, they want it to feel like part of the movie and the show. It’s a fine line between “Once Upon a Time’s” universe and the “Frozen” world. What was Disney’s biggest concern in terms of protecting the Frozen brand? Kitsis: They want to bring the spirit of Elsa and Anna into “Once Upon a Time.” This is not about trying to create a sequel. This is just strictly bringing them over to our world for a fun story. We will continue to honor the characters though. Horowitz: The characters are going to stay true to their story, but fit into our fairy tale world. It is not like how we made Peter Pan or other characters that were a complete flip and twist. From the beginning, we have always talked about love. However, it has not always been about romantic love like a mother’s kiss breaking the curse. One of the things we love about “Frozen” is it was about love. It was an act of true love verse the traditional romantic love. You described Frozen as a “a fun story,” which suggests to me you might be thinking of this—perhaps by necessity—as more of a limited storyline within your show as opposed to the more open-ended character additions you’ve had in the past. Is that an accurate read? Kitsis: Correct. It is comparable to what we did with Neverland and the Wicked Witch Arc. Right—but you did Neverland, yet Captain Hook is still on the show. It sounds like in this case, the characters will have a limited appearance and not be on the show in season five. Elsa didn’t have a love story in the movie, and that was part of what some really liked about her. Will you give her one here? Kitsis: The show has always been about family. This made it interesting to us about Elsa. It isn’t about who she falls in love with. Most of our love has been about families coming together. This is what we love about Elsa. She is uncomfortable with her powers. Her sister is what breaks that loneliness that she had too. Elsa on the show isn’t going ot be about her meeting someone. It comes down to her exploring as a person. Almost like how Regina has been for the past few years. Horowitz: Like Adam said, it is not about Elsa finding true love on the show. It is about her relationship with her sister. That is what the central point of the storyline will be. It’s a pretty comic movie, so I’m assuming your version will be a bit more dramatic. Horowitz: We are going to do our best to capture the fun spirit. Kitsis: The fun and emotional Do You Want to Build a Snowman theme makes me cry every time. We would love that deep emotion and fun. 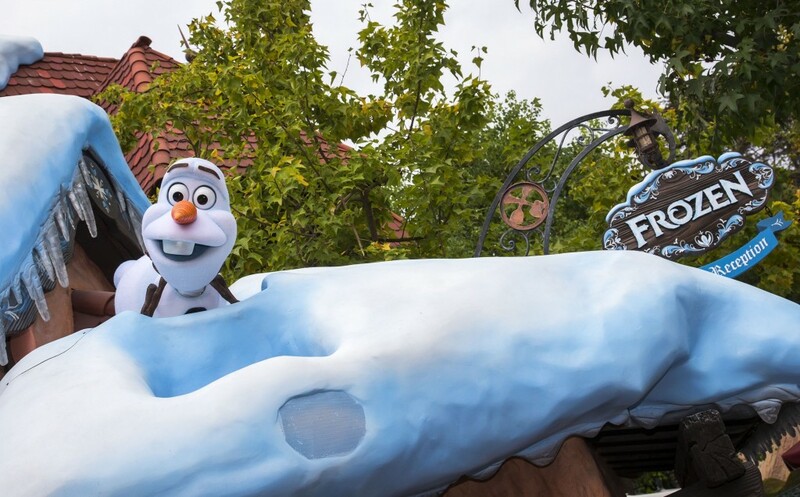 Speaking of comedy, Olaf is a character fans really want to see. But from a drama series production standpoint, it seems like one of those things where you’d be like, “Uh, how can we ever actually pull that off in a live action show?” What are your thoughts? Kitsis: Olaf will not be on the show. Horowitz: It doesn’t fit in with what they are trying to accomplish on the show. Any other characters from storyline that are going to be as well? Horowitz: Sven has been casted, but not officially announced yet. Are you doing anything different with music this season, given that Frozen is so associated with that soundtrack? Horowitz: No, there will not be a musical episode. I’ve avoided asking you specific plot questions because I know that’s the area you don’t want to get into. But is there anything you’re comfortable to tease overall about how the Frozen storyline works into the rest of the show? Kitsis: The first half of the season is about how we never give up on the people that we love. So Frozen will be introduced in the premiere, and be the first half of the season roughly? There’s been a lot of guesses for Elizabeth Mitchell’s character, whether Elsa and Anna’s mom survived that sea voyage, or perhaps that she’s playing the original Snow Queen. Anything you can tell us? Kitsis: One of the two that was mentioned. Horowitz: Elizabeth Mitchell’s character will be connected to both worlds — Arendelle and the world of Storybrooke. Since both their shows were canceled, people were hoping for the casting of Mitchell and Josh Holloway, both Lost alum, which seemed like a pipe dream. But then you cast one of them! So I should ask: Any chance of Josh joining too? Horowitz: He is not in mind for this particular act. It is possible someday if the time was right and he was willing. We would have to put together the right thing. What does Arendelle look like in the show? Horowitz: It will not be animated looking. It will be real, but we are in the process still. Since it is not animated, it is a challenge. A challenge that we are excited to try to meet.